•32-bit architecture (vs. 16-bit architecture of the TPP2). •5 to 80 times better performance, depending on the calculations and variable types. •7 times faster GPIO manipulation. •3 times larger available user SRAM (66KB vs. 22KB). •2 times larger flash memory (1MB for TiOS/code + 1MB for the file system vs. 1MB total for TiOS, code, and file system). •2.2 times lower power consumption (100mA vs. 220mA). 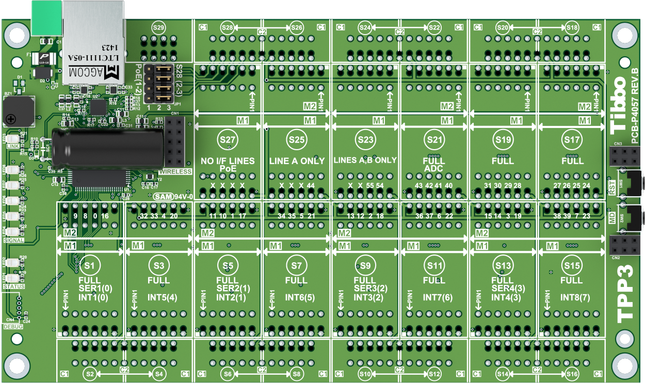 Size 3 Tibbo Project PCB (TPP3), Gen. 2 runs Tibbo OS and is programmable in Tibbo BASIC and Tibbo C.
TPP3(G2) is ideal for applications that require no human-machine interface (HMI) while calling for a significant number of I/O lines and/or functions. The board can be used to replace dumb PLC controllers or work as a safety, security, or access control device. The TPB3 is also ideal for factory, lab, shop, building, hotel, and home automation projects. Offering 7 tiles for a total of 14 "M" and 14 "C" sockets, the TPP3(G2) can be used to construct devices with up to four full serial ports, up to 25 relays, or up to 47 opto-inputs, PWM, or open-collector outputs. •Powered by Tibbo OS (TiOS). •Optional Wi-Fi interface (requires the WA2000 add-on module). •Optional BLE interface (requires the WA2000 add-on module). - Encoding and decoding of Wiegand and clock/data streams. - 4 remappable synchronous serial ports with SPI and I2C modes. •66KB SRAM for Tibbo BASIC/C variables and data. •1MB flash for TiOS and application code. •Additional 1MB flash for the hardened fault-tolerant file system. •Software-controlled PLL allows selecting full, medium, or low speed. •Power: 100mA @ 3.3V (100Base-T mode, full speed). oOver-the-air (requires the WA2000 and an iOS or Android device). * The TPP3(G2) does not support the combination of 7 bits/character mode and the "none" parity mode. adc — provides access to four ADC channels. beep — generates buzzer patterns. button — monitors the MD button. kp — works with matrix and binary keypads. lcd — controls the LCD. pat — "plays" patterns on up to five LED pairs. rtc — keeps track of date and time. ser — controls serial ports (UART, Wiegand, clock/data modes). sock — socket comms (up to 32 UDP, TCP, and HTTP sessions). ssi — controls serial synchronous interface channels (SPI, I2C...). wln — handles the Wi-Fi interface. •27 string functions, 8 date/time conversion functions, encryption/hash calculation functions (RC4, MD5, SHA-1), and more. •Function Groups: 27 string functions, 8 date/time conversion functions, encryption/hash calculation functions (RC4, MD5, SHA-1), and more.